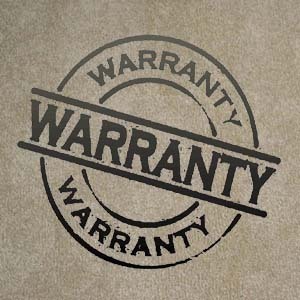 The carpet wear warranty almost always refers to wear in the terms of abrasive wear. Carpet wear is described as the actual loss of the carpet face fiber through normal abrasion (foot traffic). A carpet wear warranty will cover periods from 5, 10, or more years and some are for lifetime. Carpet wear warranties cover against becoming abrasively worn through normal abrasion. Standard percentages used to establish the amount of wear required to be considered excessive wear range between 10% and 15%. Abrasive wear is the only thing that an abrasive carpet wear warranty is covering and the fact is, while you can quickly ugly out almost any carpet, you can rarely achieve 10% abrasive wear on any of today’s synthetic carpet fibers. Covers only normal wear resulting in loss of pile fiber from the surface of the carpet. Fuzzing, pilling, shedding, crushing and matting are excluded. The carpet must be installed over a pad that meets the manufacturer’s requirement. The manufacturer may refer to a pad meeting a particular specification, such as HUD UM 72a, Class 1, or Carpet Cushion Council standards. These specifications set minimum standards for weight, thickness and density along with other Tphysical characteristics that will determine a pad’s performance. The carpet must be cleaned by a qualified professional and a period of time such as 1, 1 1/2, or 2 years will be specified. A particular method such as hot water extraction or dry cleaning will be specified by a particular manufacturer. Most manufacturers will require that receipts be maintained as proof of service. Some manufacturers will require that the consumer maintain a list of the products that are used to spot clean the carpet.